As a team of archaeologists digs through layers of history beneath London, the thought of the next find is never far away. "Just about any new discovery is thoroughly exciting," says Jay Carver, the lead on what is currently the UK's largest archaeology project. His team has been working alongside engineers building stations and digging two giant tunnels under central London as part of Crossrail since 2009. On the journey so far, finds include rare amber, hundreds of skeletons and a Bronze Age track. But for Mr Carver, among the most exciting discoveries was the Thames ironworks and ship building company which occupied the entire Limmo Peninsula. He said: "The site had literally been forgotten in the ground. It was 100 years old but we have pretty much been able to reconstruct it. "To have discovered this huge timber shipway was extraordinary. "The discovery of ancient animal bones in Paddington takes it to the other extreme to a London with wild animals, an unbelievable concept in today's world." Crossrail will connect 37 stations from Heathrow Airport and Maidenhead in the west, through central London and out to Abbey Wood and Shenfield in the east. It is due to be completed in 2018. Being a part of this giant feat of engineering has allowed the 100-strong team of archaeologists to venture into largely unexplored territory. 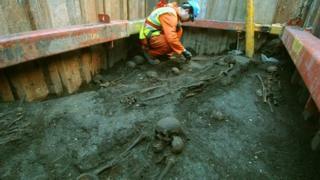 Mr Carver said: "The project has allowed us to dig so many holes across so many parts of London. "It's about filling information gaps, finding out about stuff we didn't know before and making all the details we had in the past, clearer." He explained that digging from west to east through the centre of London, which due to city's built-up nature is usually restricted, gives them a unique opportunity. "It enables us to compare and contrast areas of London by gathering scientific data from different locations, for example excavating several sites across west London and parts of the City. "Looking at how they developed from green fields into the city we know today and how the river system changed and developed over thousands of years. "It will also reveal thousands of years of history in the Square Mile which covers what was a Roman and medieval city, which are fairly unknown." Advances in technology may mean there is less uncertainty about what might lay beneath the surface, but Crossrail has still delivered a few surprises. At Canary Wharf a 55-million-year-old piece of amber was unearthed from beneath the dock bed in 2009. The archaeology team said very little amber had been found in London and this piece was larger and clearer than any previously found in the UK. The next stop for the team is Farringdon where archaeologist Mike Court will be leading a two-week excavation in January. Trial digs have confirmed an old river channel and evidence of leather production under Smithfield Market. Mr Court said: "It is exciting as you spend years doing the research then you get to dig and prove your homework." "It's close to a big plague pit from the black death so it gives us a chance to dig down but there's only a 20% chance we will find it." Meanwhile, in a trial excavation pit at Liverpool Street in February 2011, Mr Court said they came across what he considers to be the most exciting find on the project so far - a silver Denarius, a Roman coin from 225AD. "It's fairly run of the mill for sites but it gives you something in your hand which showed the time Britain was part of the Roman Empire and puts us into the wider context," he said. Looking to 2013, Mr Carver said they would be working on the largest single excavation at the site of Crossrail's ticket hall in Liverpool Street. It is expected to reveal the less salubrious parts of Roman London outside of the City walls with archaeologists anticipating to encounter Roman timber-framed buildings and a street surface 6m below ground level. The "lost" Walbrook River - a channel that divided the western and eastern parts of the city - may also be found. At the eastern end of the Crossrail route, archaeologists will work at four large tunnel entrance sites at Pudding Mill Lane, Victoria Dock, North Woolwich and Plumstead. Here it is thought the team will come across areas where Bronze Age people lived, farmed and hunted some 3,500 years ago. Only halfway through its journey, and with a total of 20 archaeology sites to explore, it is hoped there is much more to be uncovered.